Bhagwat’s address on the second day of the three-day conclave on Bhavishya Ka Bharat was seen as the first authoritative condemnation of the spate of cow lynching incidents. NEW DELHI: Affirming the centrality of the Constitution and the rule of law, Rashtriya Swayamsevak Sangh (RSS) chief Mohan Bhagwat on Tuesday said the organisation was rooted in the concept of universal humanism. 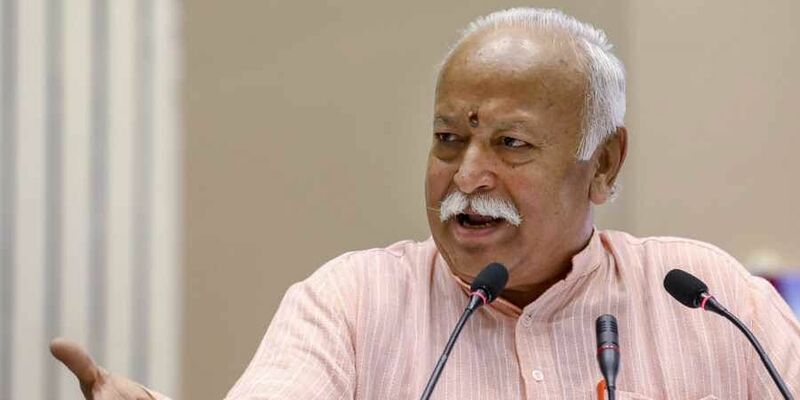 Bhagwat’s address on the second day of the three-day conclave on Bhavishya Ka Bharat was seen as the first authoritative condemnation of the spate of cow lynching incidents across the country in recent times. Hindutva, he pointed out, does not stand for annihilation of people of other faiths, adding accepting diversity includes different dietary habits as well. “It’s not Hindutva if it’s said that there should be no Muslims. It’s not Hindutva if it’s said there would only be Vedic way of life. Hindutva is a fraternity; that is the Hindu Rashtra we believe in,” said Bhagwat. Quoting stalwarts likes of Ambedkar, Tagore, Gandhi, Nanak and Sir Sayyed Ahmed Khan, he said they all saw Hindutva as being based on the principles of unity in diversity, restraint, gratitude and sacrifice, with which the RSS concurs. RSS chief Mohan Bhagwat will conclude the ongoing three-day outreach programme by answering questions submitted by the audience in writing on Wednesday. “On account of material considerations, political correctness, some may have forgotten the common ancestral and cultural heritage which embodies Hindutva. Yet, they all are ours. We have no enmity. We don’t seek annihilation of others (those who don’t share the same belief),” Bhagwat said. The commonness of ancestors, culture, and pride in the motherland shaped the Hindu identity, opined Bhagwat, adding that the core value sought wellness of all. “Patriotism, ancestral pride, and the culture are the three foundations of Hindutva,” he noted. Also, casting the RSS in a role of bipartisan social rejuvenation to imbue the idea of Indianness, Bhagwat stressed that volunteers of the outfit were free to choose their affiliations even while he rejected the notion that the Sangh remote controlled its political offshoot (the BJP). “It’s wrong to assume that phone calls could be coming from Nagpur (the RSS headquarters). There are people there (in the BJP) who are senior to me and have more experience. They are competent to take decisions on their own,” Bhagwat said, while adding a caveat that the RSS throws its weight with full conviction for “rashtraniti (national policies)” which are seen to be correct. Bhagwat further said the Sangh never dictated swayamsewaks to work for any entity.